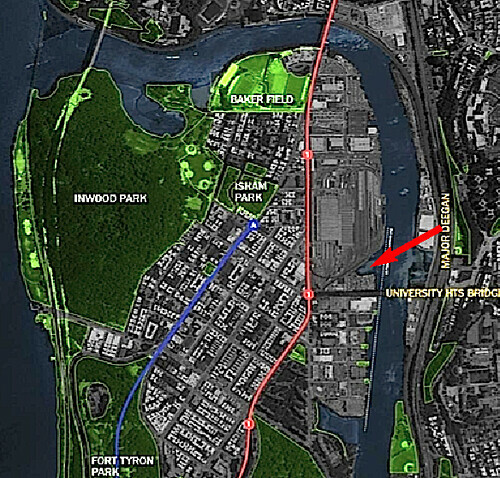 James Cataldi lives in the upper Manhattan neighborhood of Inwood. For 25 years he worked on Wall Street; now he works with the Wild Bird Fund, a wildlife rehabilitation facility. One day about four years ago, he was walking down 207th Street. Just before he was about to cross the bridge over the Harlem River, he took a left on Ninth Avenue — and stopped short. Dead end. Before him was a fence and beyond, the MTA train yard. To his left was a gas station; to his right, an industrial parking lot filled with trucks. Above, North Cove is immediately north of the University Heights Bridge. 2011 Sherman Creek Master Plan. Something drew him toward the water. He crossed a smaller, untended parking lot for MTA employees and found himself amid a shanty town of drug addicts, looking out over a small cove. 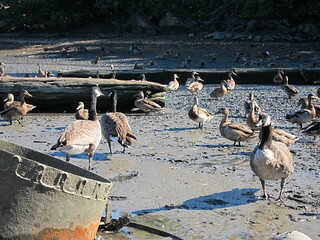 He waded through waist-high garbage and climbed down to the shore to find a few sick geese standing in broken glass. “At that moment, I felt a responsibility to do something,” he said. “Everything else was peripheral.” He began to pick up shards of glass. Four years later, Mr. Cataldi has filled close to 450 dumpsters full of glass, muck and toxic industrial debris like rusty transmissions and leaking oil cans. The addicts are gone. The birds have returned and brought thousands of friends. This past April, Mr. Cataldi, a shy man with a mission, wasrecognized by the Environmental Protection Agency for his work at North Cove, one of only 26 individuals and organizations honored across the state for protecting the environment and public health. In describing the transformation of North Cove, EPA officials note that Mr. Cataldi did not wait for permission to begin his restoration work. In fact, for the first eight months, 34th Precinct officers and MTA security called him a trespasser and chased him away. “I came back every day to clean and care for the wildlife,” he said. Today, Community Board #12 and the 34th Precinct are supportive. The MTA gives him gloves and access to dumpsters. The garage mechanics, truck drivers and security officers have accepted him, even bringing him drinks on hot days. More importantly, they’ve stopped dumping trash at the cove. North Cove is far less toxic than it used to be, but garbage still clogs the mudflat. One man can only do so much. Where car parts and rotting trash littered the shore, however, Mr. Cataldi has planted willow trees. Bird sounds fill the air — flapping, whirring, rustling, twittering, chirping, quacking. As if to remind visitors not to get too swept away by beauty of nature, an A train occasionally screeches to a stop on the other side of the fence — but the birds aren’t bothered. When the tide comes in, happy-go-lucky ducks surf Circle Line wakes toward shore. When the tide is out, hungry geese poke at the mud. Sandpipers chase each other. Egrets drop in for a snack. With virtually no resources, Mr. Cataldi has resurrected a place and created a community. 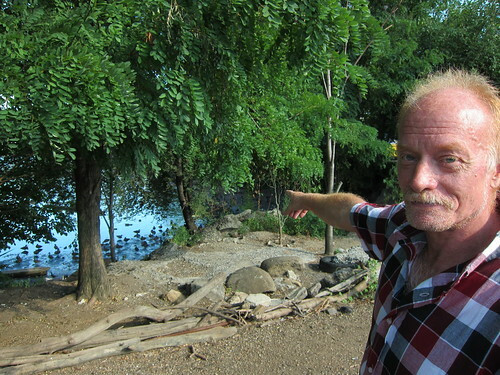 His organization, Manhattan Wetlands and Wildlife Association, now has nonprofit status. He supervises student volunteers from the English Language Learners and International Support (ELLIS) Preparatory Academy, a Bronx high school. He has hosted potluck gatherings at the cove, after checking first with the MTA and the NYC Economic Development Corporation. 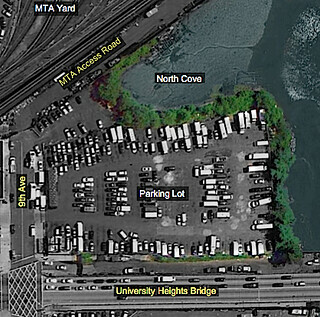 North Cove is part of the EDC’s 2011 Sherman Creek Master Plan, a long-range blueprint to revitalize the Harlem River waterfront in Inwood. Though Mr. Cataldi and Alejandro Baquero Cifuentes, the EDC vice president in charge of the master plan, may not see eye to eye on the future of the cove (EDC’s plans include a dock for public recreation; Mr. Cataldi resists the thought of any development), they have only warm words for each other. “His commitment to North Cove is commendable,” Mr. Cifuentes said. 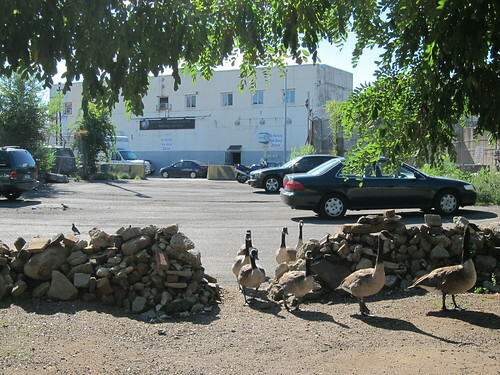 the MTA parking lot, geese enter North Cove in formation. The EPA’s important recognition has validated Mr. Cataldi’s quiet work. He is hoping to convert the groundswell of public support into grants and more volunteers, and he’s planning a full-blown environmental assessment of the cove, perhaps coordinated with the NY-NJ Harbor & Estuary Program Community Advisory Committee. As he tiptoes into the wider world of NYC environmentalists, he dreams of creating green jobs at the cove with aquaponics. People are appreciative. “The North Cove effort demonstrates how a modest grassroots project can really help transform a desolate place. We encourage people to step into the stakeholder role, bring vision, bring more people, and help shape the future of our public spaces,” said Roger Meyer, Chair of Conservancy North, a new civic organization dedicated to wise stewardship of northern Manhattan’s public areas. A successful future for North Cove, Mr. Meyer says, depends on the transition from a solitary effort to a community process. James Cataldi knows that people scratch their heads and wonder why he left Wall Street at the height of his career and is now picking up garbage. In a short video released last week by Colm O’Molloy, a graduate student in journalism at Columbia University, Mr. Cataldi reveals a bit more. “When the World Trade Center came down, it became a time of introspection and a time of reevaluting one’s purpose in life,” he says.